A company launches 3 flavors of juice (Grapefruit, Cranberry and Orange) to be sold in 2 bottle sizes (4 fl oz and 8 fl oz). Each SKU has 3 artwork components (front label, back label and cap). So the launch consists of 6 SKUs and 18 artwork components. 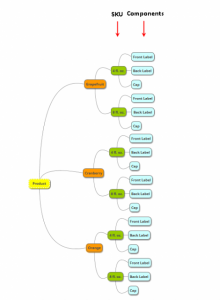 In our previous blog, we discussed about the building blocks of an artwork. A multi-stakeholder artwork review and approval process with its many variations can become quite daunting without the help of an automated system that provides the necessary review tools to seamlessly manage. This system should also facilitate the supply chain to on-board external agencies such as printers who can download the artwork and supporting files directly. 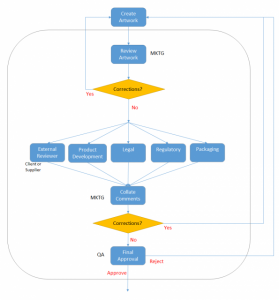 How do organizations approach artwork approval? 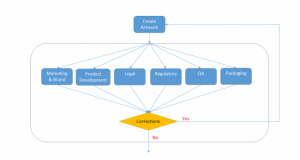 Artwork approval is usually done by users from multiple departments in parallel. The number of departments who need to approve the artwork may vary between companies, projects and sometimes may include external users like the supplier or the client. The process may include an initial review before its sent to multiple departments for approval. Similarly, there could be a final approval required after all the approvers have approved the artwork. A coordinator may be introduced after the approvers have made their comments. The comments are collated and final instructions on the changes are shared with the design team. There could be projects where a department might/ might not have the need to sign-off. For example, Legal team may not be required if the request is for a supplier change. Once approved, the artwork needs to be sent to the printer for commercial printing. 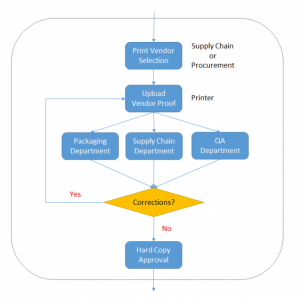 Print vendors are usually managed by the Supply Chain (SC) team or directly by the Procurement team. These teams know which printer(s) need to receive the artwork for print production and they usually coordinate the print production process. Release of Artwork also means that the source file(s) that were used to generate the PDFs have to be released. Along with the PDF, the Adobe Illustrator file, any font files, Photoshop or InDesign files and a print specification file will also be released. Since the print vendors are outside the organization, these files are usually uploaded to Google Drive or a Dropbox location. Sometimes, there is a Pre-press agency involved at this step and the artwork files are released to this agency. They are responsible for sharing a print ready PDF with the printers which will guarantee that the print and colors will be uniform across all the print vendors. It then becomes the responsibility of the Pre-press agency to share the files to be printed with the print vendors. Vendor proofs are uploaded by the print vendors after they have done all the adjustments in the artwork to make it print ready. The final modified file is shared with the brand for approval. A few department users will review and approve the vendor proofs. If it’s a first print, then someone from the brand will visit the print shop and check out the physical print samples. Variations in color within an acceptable range are agreed on and the printer is then authorized to do the production runs. Do you need a system to manage this process? Review and approval are processes that have to be carefully choreographed in order to avoid losing time and to ensure that comments from all stakeholders are captured and resolved/incorporated by the design team. Having an artwork management system with review tools can help increase the accuracy while saving time. An automation system provides consistency by ensuring right versions of the files are available to the vendors. 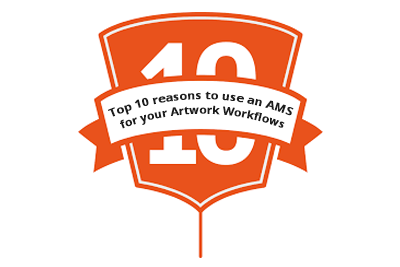 Print vendors have a crucial role to play in the artwork management process and having an artwork management system will ensure that they participate in the process online and download the files from the system thereby reducing the chance for an error to creep in.